Eugene and Ki Tae Young! OMO. THEY GOT MARRIED. MY BEST DRAMA OTP IS NOW A REAL LIFE COUPLE!!!!!! Haha, I knew about it, but missed the day. The wedding was closed off to the public anyways. 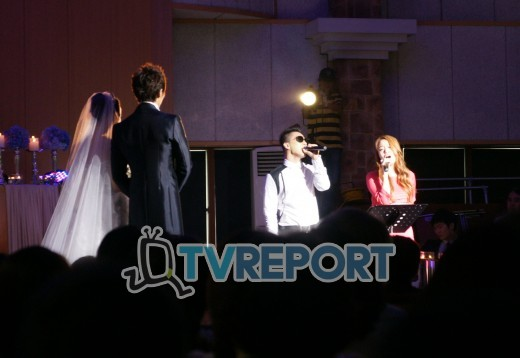 They had high profile guests, including Taeyang who sang a song he wrote himself for the newlyweds (called In the Moment, I think?) But omgeee, so cute! They’re off for their honeymoon now! KYAAAA, SO CUTE! Click below to see more pics! Posted on July 25, 2011, in Uncategorized and tagged Creating Destiny, Eugene, Ki Tae Young, korean couple, Making a Lover, S.E.S.. Bookmark the permalink. Leave a comment.